New Delhi: Situation is reportedly tense in Sisganj Sahib area in Delhi after a clash took place between the police and the Sikhs this morning. Sources said that the Delhi authorities were demolishing a “Chhabil” built in the memory of Shaheed Bhai Mati Dass ji near Sisganj Sahib with the help of police. When the Sikh sangat came to know about it they raised objections which led to police action and a clash took place between the police and the Sikhs. Eyewitnesses told Sikh Siyasat News (SSN) over phone that many Sikhs were badly beaten up by the Delhi police before taking them into custody. “The situation is very tense and heavy police force has surrounded the place. 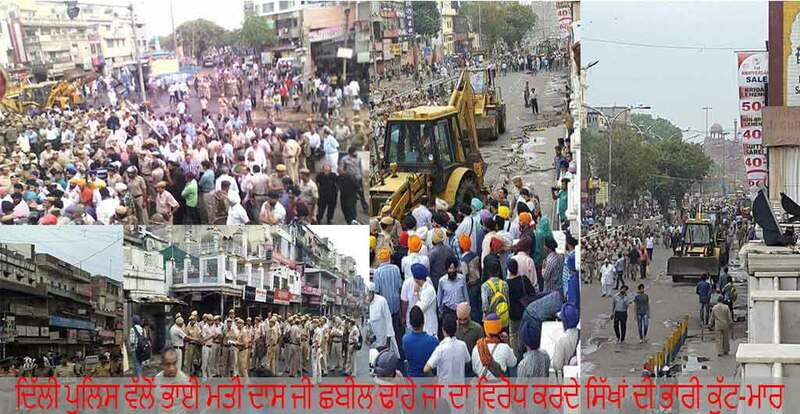 No body is being allowed to go to the place of incident where the Chhabil is being bulldozed. It seems as if an undeclared curfew is clamped in the area”, said a Delhi resident who was present near the place of occurrence. Gurdwara Sisganj Sahib is built in the memory of Guru Tegh Badadur Ji to mark the place of martyrdom of the Guru Sahib. Bhai Mati Dass Chhabil is an old structure built to mark the memory of Bhai Mati Dass ji who was martyred along with Guru Sahib. The Chhabil place was being used by the Sikh sangat to offer drinking water to everyone as a voluntary service.